I made this baseball glove cake for my five year old son. 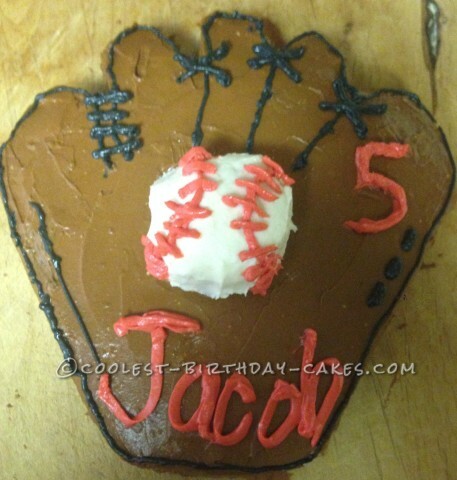 I used a circle cake to make the glove and the bottom of a cupcake to create the look of a baseball. On the day of his birthday I got all of the supplies ready to decorate his cake. I colored the frosting brown, red, and black. I left some of it white for the baseball. My kids loved helping me stir up the flavors. I like to work with my cake upside down. It gives me a flat surface that is easier to work with. Before I cut anything out I took a butter knife and made an outline of where to cut so that if I messed up I could easily fix it. I cut the fingers out and rounded them and then also cut the bottom to look more like a hand. Then came the fun part….. frosting the cake. I love seeing the cake come together on the way to the finished product. I like to make my cakes out of honey so they are more healthy. I also used a honey frosting. Many people have told me that it is impossible to decorate with honey frosting because it gets runny but I have found a few tricks to help with that. I like to put mine in the freezer for a couple of minutes so it will have the consistency I want. I also add a little flour to make it a little thicker. I put a base coat of brown frosting on the cake. I like to do the bottom layer a little thick so that I will not have a problem with crumbs.